Do You Know Enough About Ovarian Cancer? Most Women Don’t. Ovarian cancer is more treatable, and possibly curable, in its early stages. A recent study by the World Ovarian Cancer Coalition asked 1,531 women diagnosed with the disease to share their experience before and after diagnosis. Yet in all 44 countries surveyed, very few women knew how to recognize signs of the disease. Over two-thirds of women had not heard of ovarian cancer or knew anything about it before to their personal diagnosis. Others waited before seeing a doctor, even after experiencing multiple symptoms. For example, women in the USA were most likely to wait more than three months before consulting a doctor about symptoms. Even more troubling, many women across the countries reported that they didn’t receive a diagnosis for a long time nor were they referred to a specialist. For example, women in the UK had the lowest rate of women diagnosed within a month of visiting a doctor. Although the estimated time from visiting a doctor to diagnosis varied from country to country, for 10% of women, their doctors took over a year to diagnose them. Ignorance of both patients and doctors has a cost. According to the World Health Organization, nearly 300,000 women will develop ovarian cancer this year. More than half are unlikely to survive past five years after their diagnosis, and in some countries, the figure is much higher. The World Ovarian Cancer Coalition estimates that about 40,000—or one in seven women diagnosed with this type of cancer this year—won’t survive more than three months after receiving the diagnosis. 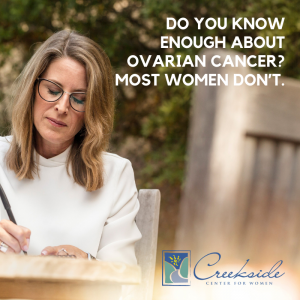 And yet, before their diagnosis, 18% of the women surveyed had never heard of ovarian cancer and 51% knew the name of the disease but didn’t know anything about it. There is no routine, simple test to detect ovarian cancer accurately. Symptoms can easily be misdiagnosed and typically begin long after the disease has established itself. Women might experience bloating, nausea, low energy, general pain, and indigestion. In the survey, most women waited more than a month to seek care after the symptoms started. Some waited six months. According to the Every Woman study, improving women’s survival rates has had slow progress when compared to other cancers. Efforts to enhance the quality of life, faster diagnoses, and chances of long-term survival for these women is a pressing global challenge. How can you act to protect yourself? First, know the symptoms and how easy it is to ignore them at first. Next, know your family history, both your mother’s and father’s side of the family. If you have a history of ovarian cancer, consider genetic testing and counseling to access prevention and new, targeted therapies. Family history is a risk factor, yet only 20% of women with a strong family history of ovarian cancer had had genetic testing. The study recommended that women do not wait to seek help or tolerate delays. If you receive an ovarian cancer diagnosis, seek a specialist’s guidance. A specialist’s assessment and treatment are more likely to offer the best chance for successful treatment and survival. Douching: Do You or Don’t You?